Sometimes the internet is a blessed thing. 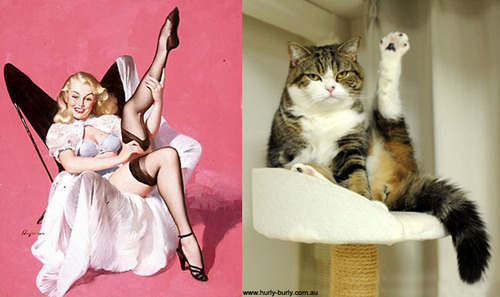 Of course a Tumblr blog entitled Cats That Look Like Pin Up Girls exists. Yesterday I saw two shows at Carriageworks as part of Sydney Festival: It’s Dark Outside and Othello C‘est Qui. “Of all the roles for black actors in the western world, Othello is by far the most powerful and legendary. Yet Shakespeare’s famous Moor is barely known in Africa. Across this cultural divide, Ivory Coast-born performer Franck Edmond Yao and German actress Cornelia Dörr unite to interrogate the confrontational world of Othello and Desdemona. Sharp, political and sensual, Othello c’est qui (Othello who’s that) is a liberating exploration of cultural clichés and boundaries. The actors reveal their distinctly expressive playing styles as they parody traditional Othello performances with candour. Together they pull apart themes of colonialism, migration, religion and politics in an urgent, seemingly improvised way. The moment that crystallised this production (aside from the stunning performance itself) were the two women sitting in front of us in the audience. Theatre etiquette should be pretty easy to follow – minimise auxiliary sound production, engage with the performers, etc. Not only did these women bring hot chips (one in tupperware, the other in extra-crinkly foil), they also brought extra gassy soft drink, which sighed quite loudly every time they opened the bottle, and turned their phones on to check they were on silent (ensuring that nice warm Nokia welcome note rang out). When I recounted this vignette to my Dad, rather than being amused he turned to me and said something along the lines of the following. He said that he’s never understood how Mum, Amy, and I can go and see so much theatre, and not be superhumans. I was gobsmacked. Just take the two shows we saw yesterday: one was intensely moving and the other provoked ideas about performativity and race that had never occurred to me. Why am I still this same person? Surely they pushed my mind and stretched my heart out by its ventricles? Why am I not better today than I was yesterday?